Hanoi (VNA) – Head of the Communist Party of Vietnam (CPV) Central Committee’s Commission for External Relations Hoang Binh Quan has affirmed that the CPV highly values the Vietnam-Germany relationship, including ties between the two countries’ localities. 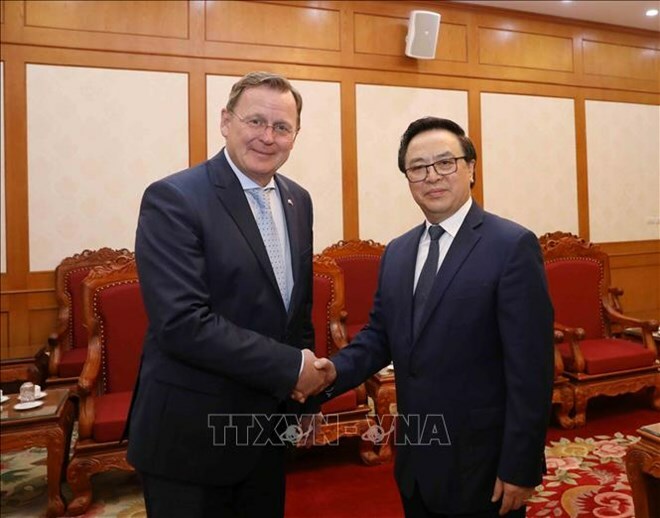 During a reception in Hanoi on April 9 for Minister-President of Germany’s Thuringia state Bodo Ramelow, Quan welcomed his guest’s visit which, he said, has contributed to pushing forward the substantial development of bilateral strategic partnership. He spoke highly of Party ties between Vietnam and Germany over the past few years, including ties between the CPV and the Left Party of Germany. Ramelow, for his part, expressed his wish to promote ties between the two nations, as well as between Thuringia state and Vietnamese localities. He agreed that both sides should further step up ties between political parties to lay the foundation for economic, trade, and investment ties, as well as people-to-people exchange. Both sides hoped that the visit by the Minister-President and over 70 German firms would open up business opportunities in the near future.